Fresh out of give them a chance. – Wadayasay? Fresh out of give them a chance. Kelly Ann is being investigated for an open ad on Fox morning for Ivanka, and Donald steaming mad that his daughter is being boycotted to the point that retailers are dropping her product like hot potato. We know this because Donald is tweeting about it. The president of the United States is tweeting about Nordstrom’s. 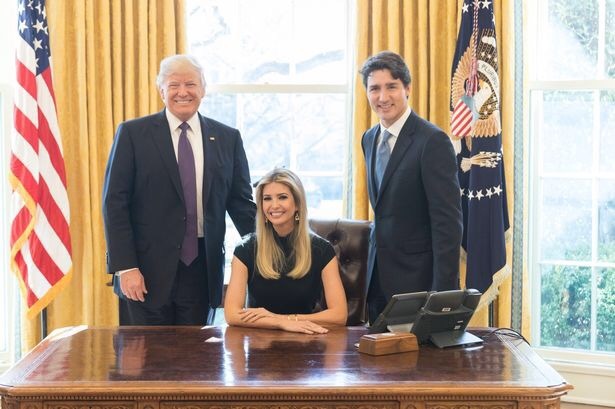 While his daughter is posing with the Canadian prime minister and has her father in the White House sitting behind the desk. I’m supposed to not see the conflict of interest? Naw Son. We’re supposed to give that a chance? This is incredible! The White House is openly hawking a product sold by the daughter of the president! She’s a brand. Her Dads a brand! How is this even wait and see? Next Wish it had worked.